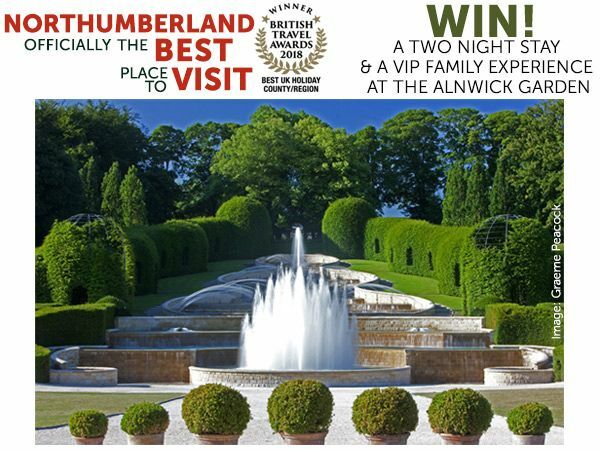 Northumberland, officially the BEST place to visit invites you to enter our competition to be in with a chance to win a VIP experience at The Alnwick Garden & stay at Middlemoor Farm. In 2018 Northumberland was voted the BEST UK Holiday Destination, by the public in the British Travel Awards. What better way to celebrate this achievement than by giving you the change to win a VIP experience and stay in the county! The award winning Alnwick Garden are here to add the fun, frolic and fabulousness to your trip with a VIP Package including: Friends Membership to the Garden so you can visit all year long, a delicious lunch at The Pavilion Kitchen and a tour with head gardener Trevor Jones who share the secrets of the Poison Garden with you. You’ll also receive a round of crazy golf at The Forgotten Garden, 2x GIANT Adventure children’s goodie bags and an exclusive copy of The Alnwick Garden book signed by Her Grace the Duchess of Northumberland. As if that wasn’t enough you’ll also be wined and dined at the stunning Alnwick Garden Treehouse Restaurant on a lunch or evening of your choice. Take a seat and Searcys will see to your every need with their fabulous new menu. The smells form the restaurant as you wander over the wobbly rope bridge will have you drooling! When visiting The Alnwick Garden you’re invited to stay at Middlemoor Farm; this working farm is set in tranquil countryside just North of Alnwick. Hidden in the hills you’ll find two moored longboats just waiting to be explored. These unique and quirky self-catering units are sure to float your boat. Miss Ellie is reserved just for you, sleeping a family of 4 she offers the perfect base for discovering Northumberland. The winner will be the first name drawn at random from all entries. Date Restrictions: All prizes must be redeemed within 1 year of winner notification. Prizes are non-transferable and no cash alternative is offered. The winners will be responsible for their own transport to and around Northumberland. Additional beverages, meals, snacks and extra facilities are not included in the prize package. Employees or agents of Northumberland Tourism, The Alnwick Garden or Searcys may enter the competition. For further details please send a SAE to the promoter: Northumberland Tourism Ltd, Wansbeck Workspace, Rotary Parkway, Ashington, Northumberland, NE63 8QZ.